Iam a textile artist living in idyllic rural Shropshire with a passion for colour and all things stitch. Last Saturday saw a busy and exciting opening to The Birds Of Wales Exhibition at Oriel Ynys Mon, Anglesey. After having a sneak peek earlier on in the week when I was delivering my work, I couldn’t wait to get back! 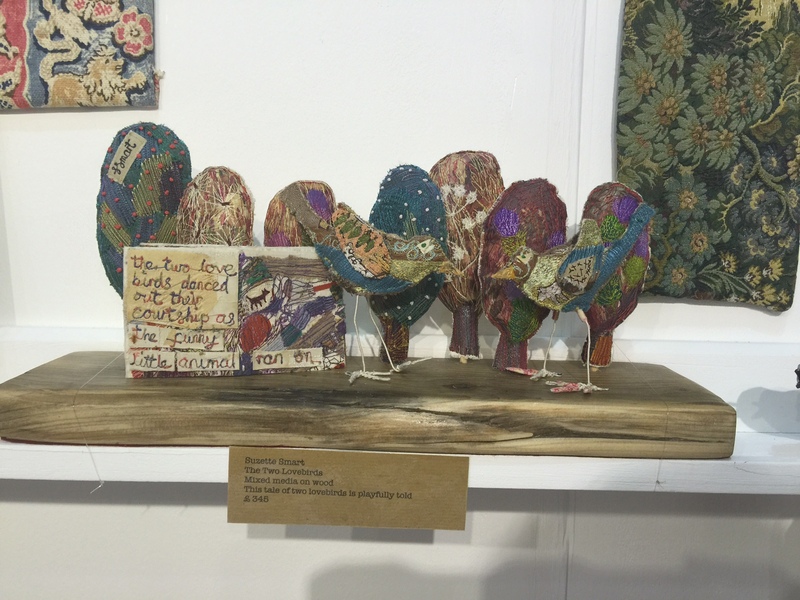 The show is beautifully brought together with work from artists and makers from across Wales and the borders, all depicting the ‘Birds of Wales’ in their own unique way. A colourful workshop with members of the Much Wenlock WI brought Open Studios 2017 to a delightful end today. Textile stories and techniques have been exchanged as those who stitch do! Thank you for all my lovely visits. And I said goodbye to my blackbirds as they went off to a new home. I have had another fabulous time running textile workshops for The Ow Bist Project this week. The Project is run by the Qube in Oswestry and gives people in rural areas the opportunity of joining in on a range of creative workshops. At one of the workshops someone shared their collection of exquisite textiles which included a Shamans robe from China. Inspiration aplenty! The project was made possible with a grant from the Paul Hamlyn Foundation. If you would like more information on the project, go to http://www.qube-oca.org.uk and look for Special Projects. 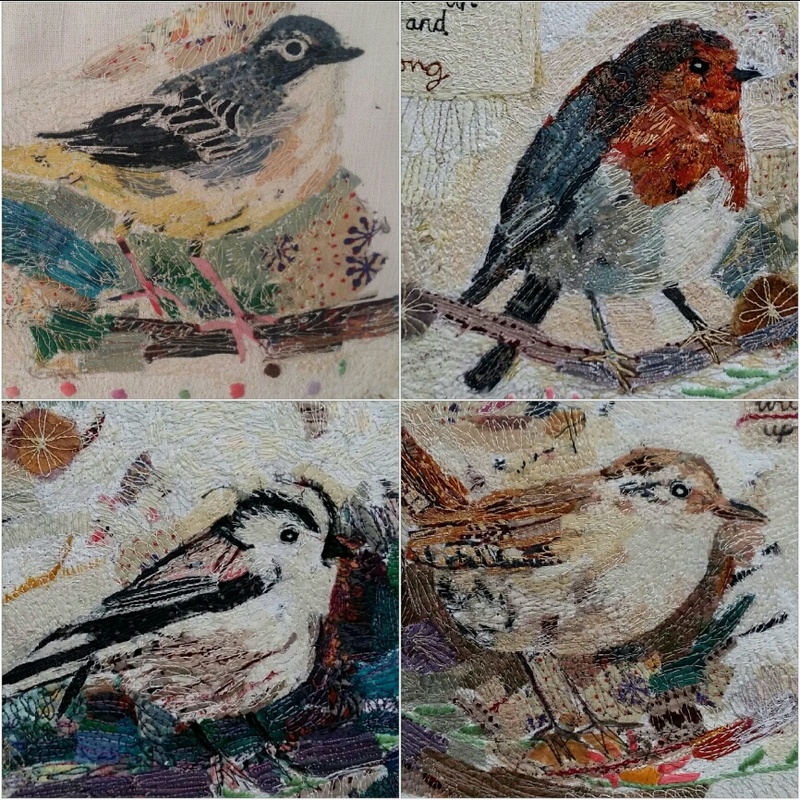 These garden birds and other work can be seen at my home studio and at The Willow Gallery next month as part of Open Studios in and around Oswestry. (10th/11th & 17th/18th June) There will be demonstrations and I may have cake! And some of my embroideries will be flying further afield this Autumn as part of the following two exhibitions. With a little mixed media and plenty of stitch, I’m very happy with these finished books. I worked the various layers across the base fabric, and didn’t define the ‘pages’ until the very end. The covers are more detailed with a title, running stitch and bullion knots. I like them as they are but would quite like to open them out and frame them too! Choices, choices. If you would like to make your own Mixed media / stitched Book, join me for a workshop at The Qube, Oswestry on Wednesday, 5th July. Stitch, create and be happy. Finished yesterday, this piece is definitely not bashful! With all the bursts of yellow daffodils and some handsome visitors to my garden, I definitely had a Spring time tale to tell. A wonderful excuse to use some of my most vibrant fabrics and threads for piecing and stitching these colourful characters. And for now, back to the sewing machine to tackle the blossom that is in full bloom. I know Spring is in the air when the blackbirds make themselves known in and around the garden and hedgerows. I couldn’t resist their charms this year so they are featuring in a new stitched book. There is a sneak peek of the first layer below along with one I did earlier! It will be a mixed media piece and will take the form of a concertina with a little bit of running stitch to finish off. Inspiration is sometimes in short supply during the month of January. The skies are grey and Christmas feels like a long time ago. So I dig deep into boxes of fabric and threads and take a closer look at the landscape around me. Plants, animals and birds soon have me piecing and stitching away. A new must buy of recycled sari silks helps too! Next week I will be out and about visiting Staffordshire Patchworkers and Quilters with more tales of inspiration behind the stitch. Please see their website for further details. And finally, a couple of workshop dates for your diary. These pieces along with others will be in exhibition later next year. With work pinned and hung around me, the ideas and stories are easy to develop. A little observation at the bird table helps too. As for this forthcoming weekend, I’m looking forward to stocking up at the Knitting and Stitching Show @ Harrogate. A new thread or piece of fabric can add something new and unexpected. I’m also excited to see Anne Kelly’s Gallery where I will find this piece of work. A stitched tale of two lovebirds. May must be one of my favourite months as the trees and hedgerows are dense with blossom and cow parsley. That’s why I couldn’t resist stitching this new emboidery. An alternative name for cow parsley is Queen Anne’s lace, so it was quite fitting that a little bit of lace found it’s way in. Borders and hedgerows workshop on Wednesday, 21st September. See dates for the diary for further details.